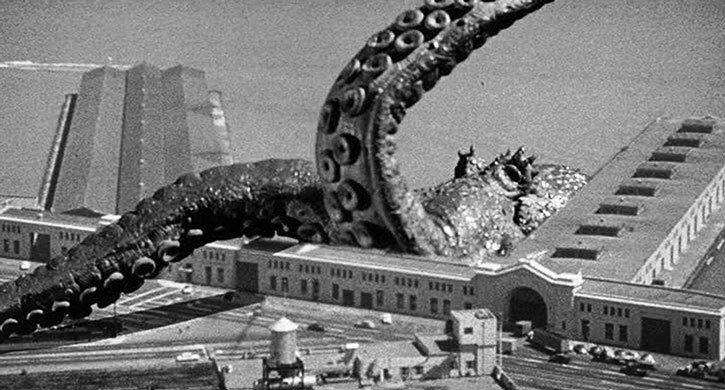 The DANGER: Astoundingly colossal octopus! Driven from an oceanic trench by atom bomb tests, is now radioactive! Faster than a military submarine! Strong enough to pull a section out of the Golden Gate Bridge, and drag an entire steamer vessel into the depths! Possessed of surprising intelligence (like all octopi)! Suspiciously hides two of its limbs at all times! The opening credits, shown rising out of the sea, are among the most stylish I've seen from a film of this period. They're preceded by a newsreel like narration that recurs throughout the film, and gives the impression that the proceedings are a dramatization of actual events. Did this actually happen?! A submarine is attacked by the monster in the first scene, but, unusually, the vessel escapes. Possibly the giant octopus gave up on cracking the thing open, given the effort needed and the comparatively small payoff. Like a Pomegranate - all that work for some seeds. I'm beginning to notice a common, specific element in these 50's monster movies: the pushy, overbearingly heterosexual military protagonist. At least here the female lead holds her ground much of the time, but sadly still falls for the advances, in the end. The film even directly addresses female empowerment, though it's partly lip service. On the other hand, there is a scientist hero who gets to take significant action in the climactic showdown, which is a terrific sequence in its own right. It Came From Beneath The Sea features effects by the incomparable stop motion - or dimensional - animator Ray Harryhausen. Harryhausen is one of my personal film heroes, and the work here is among his earliest. While it only shows glimpses of the heights his craft would reach, there is still much to appreciate. The tentacles move with ease and agility, and the scene in which the beast drags a steamer under the waves features great compositing work over actual ocean footage. In the later attack on the seaside town, there are some nice moments of animated building damage, which he would master just the following year in Earth Vs. The Flying Saucers. There are a couple of instances where the two planes of footage (effect and location) are successfully married with the use of live extras. The tentacle smashing a shop window, with a screaming bystander in the foreground being a personal favorite. 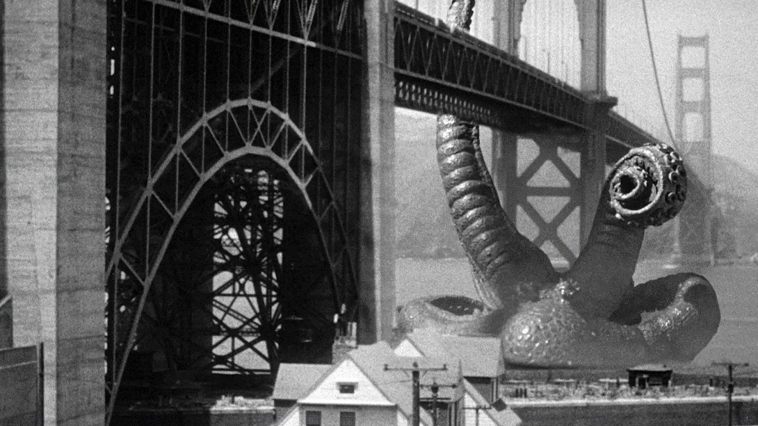 Harryhausen referred to this creature as a "Sixtopus", as budgetary restraints allowed for the construction of only six of the usual eight tentacles. Thanks to Ray, it only served to make the aquatic antagonist even more special. Dec 31 Is Star Wars: The Last Jedi Actually a Bad Movie?